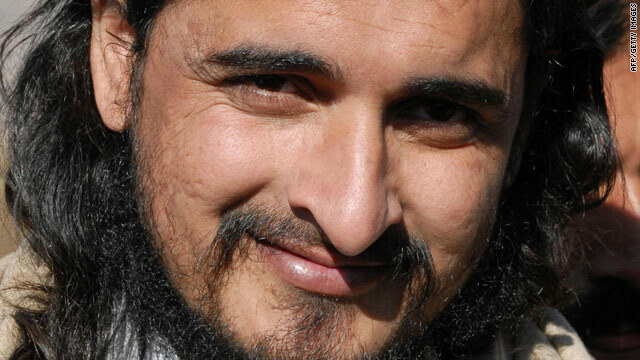 Sources say Hakimullah Mehsud was injured in a suspected U.S. drone strike. Islamabad, Pakistan (CNN) -- The leader of the Taliban in Pakistan, Hakimullah Mehsud, was wounded in a suspected U.S. drone strike Thursday, intelligence and Taliban sources told CNN Friday. A Taliban spokesman denied Thursday and again Friday that Mehsud was hurt. The spokesman, Azam Tariq, said Mehsud had left the site of the attack -- a converted religious school -- before the missiles struck. He dismissed reports of an injury to Mehsud as propaganda. Other Taliban and intelligence sources, however, said doctors were treating Mehsud for wounds he sustained in the drone strike. The drone attack killed 10 people, with four missiles landing near a madrassa, or religious school, Pakistani intelligence and local officials said Thursday. The school had been converted into a training camp for militants, the officials said. Meanwhile Friday, another suspected drone strike killed five people in the village of Zarini, in North Waziristan, two intelligence sources said. No additional details were immediately available. The strike happened in the village of Pasal Kot. That's in North Waziristan, part of Pakistan's volatile tribal region that is the site of previous drone strikes and clashes between the Pakistani military and Islamic militants. It comes a few days after Mehsud appeared in a video the Pakistani Taliban released. In it, he sits next to Humam Khalil Abu-Mulal al-Balawi, the man believed to be the suicide bomber who killed seven CIA employees and a Jordanian army captain at a base in eastern Afghanistan on December 30. Baitullah Mehsud and Hakimullah Mehsud are from the same tribe, not from the same family. In the video, al-Balawi said, "We will never forget the blood of our leader Baitullah Mehsud, may God have mercy on his soul," according to a CNN translation. "It will remain that we take revenge (for his death) in America and outside America. It is a trust on every person who left everything for the sake of God, whom Baitullah Mehsud supported." At one point, the video shows the date of December 20, 2009. That is five days before Nigerian passenger Umar Farouk AbdulMutallab allegedly tried to blow up a Northwest Airlines flight to Detroit, Michigan. The Yemen-based group al Qaeda in the Arabian Peninsula has claimed responsibility for the Christmas Day plot. It is impossible to know whether the date on the video is accurate, or whether al-Balawi was aware of AbdulMutallab's alleged plans. If al-Balawi did know about the plot, it could indicate a greater degree of communication between the Pakistani Taliban and al Qaeda than previously thought. Among the seven CIA employees who were killed in the December 30 attack were two members of the private security firm Xe, formerly known as Blackwater. The Jordanian military officer who was killed was Army Capt. Sharif Ali bin Zeid, a cousin of Jordan's King Abdullah II. It was one of the worst attacks ever on America's intelligence community. Jordanian and U.S. intelligence agencies apparently believed al-Balawi had been rehabilitated from his extremist views and were using him to hunt Ayman al-Zawahiri, al Qaeda's No. 2 figure, a former U.S. intelligence official said. Al-Balawi was a Jordanian doctor whom Jordanian authorities had recruited as a counterterrorism intelligence source, a Jordanian official told CNN. He said the video that his faith cannot be sold to bidders, an apparent message to Jordanian and U.S. officials that they had failed to win his allegiance. It puts into question how well the CIA and other intelligence agencies can penetrate al Qaeda.